Hate crimes differ from conventional crimes because they are meant to incite fear and intimidation in an entire group or class of people. The Matthew Shepard and James Byrd, Jr. Hate Crimes Prevention Act of 2009 gave the federal Department of Justice the ability to investigate and prosecute hate crimes against LGBT people. But anti-violence advocates and LGBT movement organizations are continuing work to develop and strengthen hate crime protections at the state level. Talking About Inclusive Hate Crime Laws, developed prior to the passage of the inclusive federal hate crimes law in 2009, focuses on emphasizing the overwhelming public support for LGBT-inclusive hate crimes laws, sharing stories that illustrate how LGBT people have been targeted for and hurt by violent hate crimes, and reminding people that hate crimes laws already exist across the country and are supported by law enforcement. Movement Advancement Project and GLAAD. May 2009. "Talking About Inclusive Hate Crimes Laws." MAP's Talking About LGBT Issues Series. 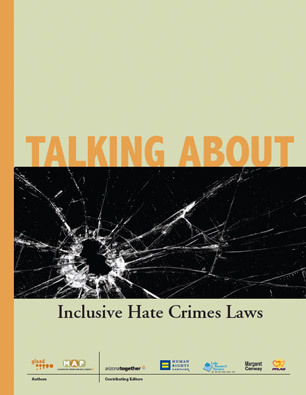 http://www.lgbtmap.org/talking-about-inclusive-hate-crimes-laws (date of access).